The 'Forgotten Olympians' Of 2018 Winter Games: Winners Even Without Medals : The Torch We know the names of the stars: Mikaela Shiffrin, Shaun White, Adam Rippon. But what about the athletes who compete and receive virtually no attention? Alexia Paganini of Switzerland competes on Friday. "To know my whole family from Switzerland is watching me," Paganini says, "It's just an honor." Still, the majority of athletes at the games will not be in the record books with gold, silver or bronze next to their names. It's almost like they're the forgotten Olympians. But if you cover an Olympics, you get to see many of the forgotten ones. Not only competing, but afterwards in what's called the mixed zone. It's an area between where the competition is held and where the athlete ultimately wants to go — a locker room, a quiet space away from reporters and fans. The mixed zone is where those reporters live, waiting with cameras, notepads and recording iPhones to prod athletes with all kinds of questions. Athletes are required to pass through. They're not required to stop and talk. For the medal winners, there's always a throng of journalists waiting. For the forgotten Olympians, the mixed zone can be an awkward journey. Walking past reporters and not getting asked to stop and chat can be further confirmation that you are forgotten. But talk to some of these athletes, and you realize "forgotten" is a relative term. Here's what just a few of them have to say. "Oh yeah, my phone was exploding with messages! From my family, friends," Alexia Paganini said after finishing her free skate in the ladies figure skating competition at the Gangneung Ice Arena. The 16-year-old American-Swiss athlete placed 21st in her first Olympics. While the world talked about the top three — Alina Zagitova and Evgenia Medvedeva for the Olympic Athletes From Russia contingent, and Canadian Kaetlyn Osmond — Paganini heard from family, friends and Switzerland, the country she decided to represent last year. She was born and raised and lives in the U.S., but has had a Swiss passport since birth. "It means a lot to me to represent a country that's so close to my roots," said Paganini, whose father is from Switzerland. "To know my whole family from Switzerland is watching me. It's just an honor." And she didn't mind not being part of the global conversation about the Olympic figure skating competition, one of the Games' marquee events. "I came in here knowing I wasn't going to medal," she said, "so really I just look up to these skaters who are the top of the podium. I just think what can I do to become as good as them, or be competitive with them. So really it [the lack of widespread attention] doesn't bother me." 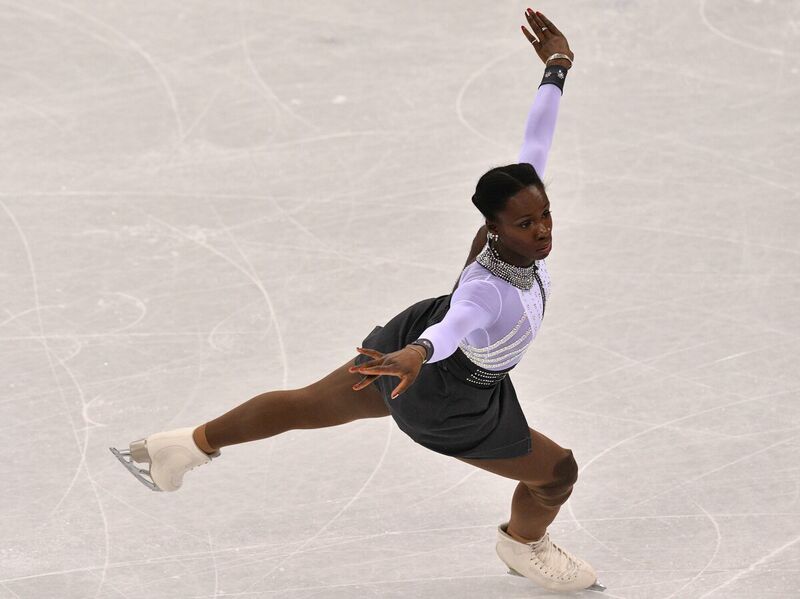 France's Mae Berenice Meite competes in figure skating on Friday. Mae Berenice Meite of France is 5'6" but her skates make her several inches taller than the one reporter who stops her to ask questions. Meite finished 19th after the free skate. "Not the best I could've done technically," she said. But then she flashed a proud smile. "I'm very happy because I put my heart out and I tried to enjoy as much as possible. Because it's an opportunity for me to be here and I've very happy to have represented France." 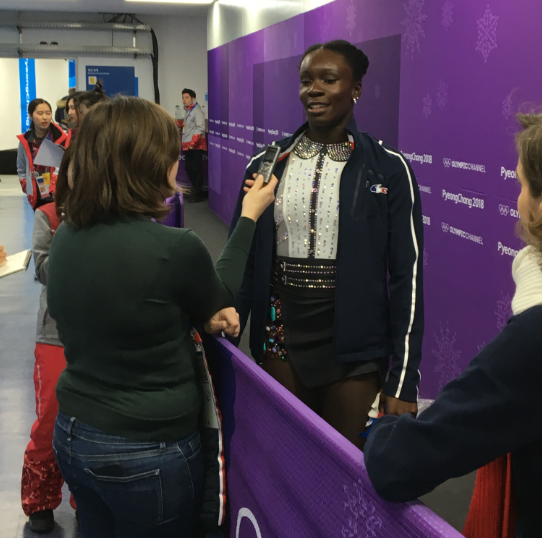 French figure skater Mae Berenice Meite manages to catch the attention of one reporter in the mixed zone, where media members wait for athletes after they compete. Meite is a relative unknown — she finished 19th in the ladies individual event. The biggest stars are greeted by a throng of journalists. "I'm taking my time to make my own history," Meite said. Meite was a reminder that many of the forgotten Olympians still are quite accomplished — the best in their town, their region, their country. Meite was the only skater from France to qualify for the free skate and although 23, she has her sights set on her third Olympics, in 2022. This is despite the current youth revolution in the women's sport — gold medalist Zagitova is 15. "I'm taking my time to make my own history," Meite said, "so step by step [and] in four years hopefully they will talk about the French skaters too." And with that, Meite nodded, smiled and walked off through an empty mixed zone. "You dream of other things"
Sometimes the forgotten Olympians flit through the mixed zone like ghosts. Not looking up; not making eye contact with reporters to save themselves the embarrassment of not being asked to stop. 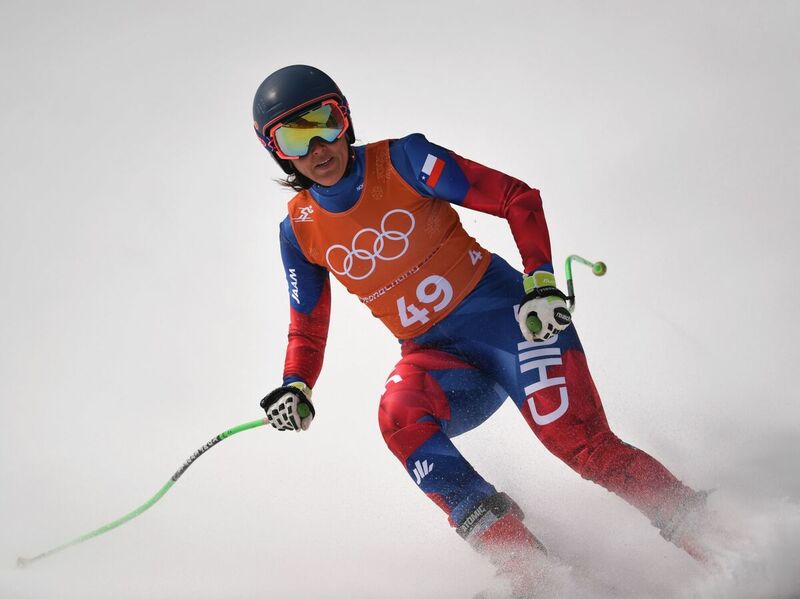 Skier Noelle Barahona of Chile crosses the finish line of the second training of the Alpine skiing women's downhill race on Monday. Noelle Barahona of Chile wasn't one of those. This past Wednesday, Barahona finished 25th in the ladies downhill Alpine ski event. After her run, she stood in the mixed zone watching the venue ceremony at the Jeongseon Alpine Center, with the three top skiers standing on a podium. "Obviously everyone deserves to be here," she said, adding, "but I think the three people who won, for different reasons, and different stories, maybe deserve it that one-hundredths more." The 5.02 seconds that separated Barahona from winner Sofia Goggia of Italy may not seem like much. But Barahona knows those few seconds represent a chasm in her sport. "We watched the runs of the top 10," she said, "They all looked sick. I was like, I think I could train for 100 years and never be that good. But it's inspiring to watch, really. It's crazy what the human body is capable of doing, especially in this sport, where it's 100 percent you that makes the speed. You don't depend on anything else and you go so fast." Barahona may be quick to praise those at the top. But she speaks for many a forgotten Olympian too when she says accepting relative anonymity has its limits. "Sometimes it's weird," Barahona says. "When we have [technical] races and they do, like, the medal ceremony before the last [skiers] go, it's like, 'Wait I'm still here you know?!' It's a little bit bumming. Like, oh man nobody has faith in me, y'know?" Barahona says Czech skier and snowboarder Ester Ledecka gave the forgotten ones hope at these Olympics. Starting 26th in the super G, Ledecka scored a stunning upset when she beat the world's best Alpine stars and won the race. "You always say what if today is the magical day that I get a medal?" Barahona says. "ObviousIy, I think everyone thinks that. Even the last finishers. Ester won the super-G here and I think her goal was top 20 you know? So for sure, you have something in mind, you dream of other things." For Barahona, the Olympic dream is over. Including Pyeongchang, she's competed in four Olympic Games. But she says she's quitting the sport after this season. "Time to move on," she says. "I love skiing. I've always loved skiing, but I love doing other things as well. There's a new chapter coming up. I'm excited about it." And perhaps whatever she chooses, she'll be able to come out of the shadows a little bit more. A previous version of this story misspelled the names of Alexia Paganini and Sofia Goggia. This post had also suggested that 2,646 athletes wouldn't win medals – an incorrect total that does not account for the multiple medals given out in sports with more than one competitor. It's still accurate that most of the 2,952 athletes who compete in the 2018 Winter Games will not earn a medal.